A project manager has to deal with customer expectations, project deadlines and evolving priorities, all of this while trying to coordinate and manage the team and respond to stakeholder demands. Let’s face it, it is a demanding job that takes time and effort to manage all the parts and sometimes hours are never enough! Project managers are involved both in managing the workload of their team as well as managing their workload. The organization and time management skills are therefore essential to ensure that the work is done as efficiently as possible. This is why it is so important to think about how to prioritize and organize the workload. Keeping the workload under control saves time, simplifies processes, reduces costs and improves productivity. Here are four suggestions for effective workload management. We spend most of our working life managing the expectations and priorities of other people. And when those expectations are not clearly communicated, the project team does not know the limits and rules in which it should operate. Clearly establish goals from the beginning and organize regular meetings for each new project and during the lifetime of a project, clarify the situation with the entire team. All those involved in the project should know the general vision, the role they play and how they should behave. These meetings serve to set the basic rules, answer questions and doubts and make sure everyone is moving in the same direction. Internal planning documents are valuable for these initial conversations. FAQ, frequently asked questions about the project. The planning documents also serve as official documents to consult during the entire duration of the project. The project document can also be reviewed during meetings with customers and other stakeholders to remind them of the goals and direction of the project. Establishing clear and realistic expectations at the beginning of a project and ensuring that these are accepted and respected by all stakeholders is the key to avoid potential disappointments and mistrust. Even the smallest misunderstandings can cause stress, frustration and resentment among the employees. A clear and coherent communication from the beginning can help to avoid these negative emotions and feelings. A structured communication process is essential, especially when activities become more complex. Not only it is necessary to make regular meetings with the team in order to remember the goals of the project and to align on the activities, but also to share the feelings the various members and if they have particular worries. This dialogue also helps to understand how and when it is necessary to make transfers of resources to provide better support to the team and make it work better. Even if everything is done for the best, deadlines and costs are in line, and the team is doing a good job, it is right to inform employees that their work is appreciated. The key is to help them understand and stay focused on the big picture and goals, support them and continuously recognize how their contributions are driving the project. What are the skills of the project team? Who is actually available during the entire duration of the project? What are the strengths and weaknesses of each collaborator? Often there is the temptation to overload the best employees at the expense of others. However, this behavior will not only lead the top performers to a possible crisis, but also the other collaborators to get bored and lose interest in the project in general. A solution could be, for example, to leave to the more performing team members the most complex tasks and everything else is distributed evenly in the team. Clearly, staffing needs will change during project execution. For this reason, you need to be aware of how each member of the team spends their time, so that there is space for flexibility to adjust the course when necessary. The resource program, like any project activity, must also be strategically planned. Moreover, it is also necessary for everyone to understand expectations and how everyone is contributing to superior goals. In case of doubts or problems, the team should not be afraid to communicate or and should not find blocks to communication in the work environment. It is the responsibility of the project manager to ensure a fair amount of work for all team members, based on their individual knowledge, skills and experience. You can not manage what is not measured. Therefore, it is essential to have workload management software available to keep track of project successes and challenges. However, in particular situations, such as meetings, it is possible to use also other effective tools for managing workload … such as a notebook and a pen. Every day, when analyzing the situation of the project, it is possible to take note of any opportunities or possible risks. During meetings with employees and stakeholders, you can take note of doubts, questions, feedback, impressions that are exposed. Over time, by reviewing the notes, you will be able to keep track of project results and resource trends. Perhaps a customer’s projects exceed the budget everytime? One of the team members is constantly overloaded with work while another continues to ask for more responsibilities? If you create a constant habit of taking notes and examining them every week or month, you can identify what works and what does not and start solving the recurring problems, so that they do not persist. What worked well in this project? Why did this project exceed the budget? Has this project been profitable? Who is overburdened with work? Understanding and recording these data helps identify which process changes are needed, so you can iteratively improve your priority and organize the workload. It is clear that the use of a special software is essential to simplify and optimize the outputs of this analysis. In fact, the classification of data allows an analysis of them, as well as the strategic use with a view to improving the company. Proactively making intelligent decisions about the flow and workload of the team becomes functional thanks to the use of integrated project software. Do you have any suggestions on how to manage the workload to the fullest? What were your biggest difficulties? Start planning the workload of your project. Of course TwProject allows time tracking. And it can be done at different levels of depth. The easiest way comes along with the creation of a project: just name it, give it start and end dates, and it is done, as you can start immediately to track the time spent on the project. There are many time tracking tools out there: in Twproject time tracking is part of the project management and it is integrated with the others features of the tool. Twproject time tracking system is flexible and customizable: because projects in different fields have a different approach to the workflow and the time spent on the project itself, and so different needs about time tracking as well. Twproject time tracking system allows issue / ticket based worklog, time planned worklog, timer based worklog: different positions, different jobs, even different departments of the same company could need a different approach to time tracking. But with Twproject you don’t need different tools for different time tracking needs. All the different ways to track the time can be monitored, validated, approved: it means that generated costs can be verified any moment. Meanwhile, everything happens on the basis of the principles of sharing and networking: the expected workflow is micro-managed (in issues) and macro-managed (in tasks) within the team. The project agenda is shared within the team as well: if something goes wrong and resources have to be reallocated, or the agenda has to be reshaped, for an “emergency”, it will be easy to manage what’s happening also in terms of time tracking: all the whos, whats and whens of the project are in the same place, and the time needed and employed for an issue or task is easy to be checked whenever it is needed and by whomever is needed. Cloud customers can write us if they want this upgrade. 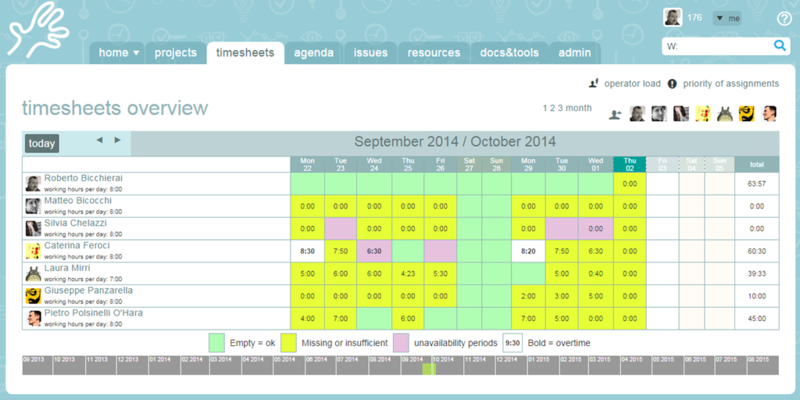 Timesheets overview and alert job: a better view on future days and link from cells to weekly timesheet. Agenda: more space for hours and auto-scroll to current hour. Task editor and resource editor: a new compact set of buttons. A free upgrade release for all users of version 4.0-4.2, this release includes some major extensions of functionality; while there is no “revolution”, this kind of release makes your “Teamwork life” more comfortable. 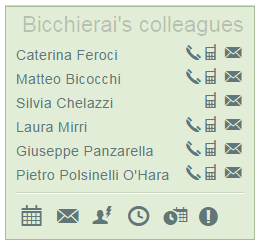 Several features requests from the feedback service have been fulfilled. Also the user guide has been updated. This was motivated by this request: “Manage graphical Gantt-type overview of all projects”. We then realized that all it needed was the filtering power of projects search together with a Gantt style visualization. So this is what we’ve done: we added an additioanl visualization of the search results. 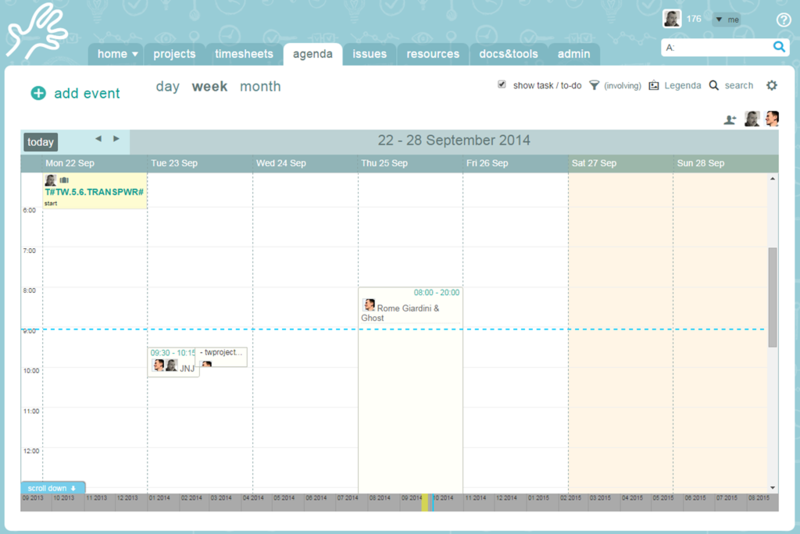 So for example you can see all your root open project closing in 2 weeks in a Gantt style view. Also all the Gantt scales have been extended to 5 years. Import of issues and resources from CSV files: issues get imported from the Bugzilla CSV export format, but of course in this way you can import from anything. Projects trees can be collapsed and there are options to keep them open by default etc. . This was this request; thanks to Halil for the first implementation. Twitter integration with any action and there is a new portlet for filtering tweets on any topic: see the user guide, section 8.3.3. – All notifications have in the subject the task they refer to, if it exists (this request). – Display log on descendants (this request). – Balloons have no more the confusing Roman number. – Use darker gray on Gantt duration background – better prints. – Search analysis worklog: make the field “action” larger. – In resource list there is no more the bothering default filter by company. – Snapshot of a task can be edited. – Search analysis worklog: make the column “action” larger. 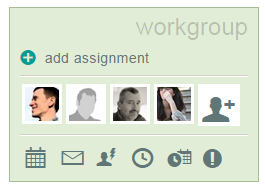 – Issue multi editor: if there is a task on the issue and you have an assignment on it, let the watch icon appear even if the issue is not assigned to you. – Issues didn’t get indexed any more for full text search. – Order in company news doesn’t work. – Portlet news doesn’t show news ordered by order factor. – Resource hourly cost sometimes gets set to zero. – Meeting: drag&drop multi editor doesn’t work for the just inserted. – The link to resource drawn by the smart combo if the resource is from another area on which you have no right you see the link but you get an error. – Search of a string containing ” in issues looped the application. – Sometimes the rollover menu opened in the wrong direction. – If you change the allowed file storage roots, disable links to old locations. This release build is 11250; it contains no database schema changes for all users of 4.2.10080 and following. As it contains an issue full-text indexing fix, you should reindex your data: see 17.4 of the user guide.